Breast cancer is more than a disease, it is a community. During the most challenging, debilitating and frightening time in our journey, there are people we meet who give us hope. Mary Heron-Rzepka is one of those givers of hope. Mary’s story will inspire you to channel your anxiety into your healing and give back to those who need help. Breast cancer has been part of my family for years. My older sister was diagnosed with breast cancer at the age of thirty-two. She had a mastectomy and chemotherapy while raising her one-year-old son. Today, 28 years later, she is cancer-free. My mother had breast cancer twice. First she had a lumpectomy, then years later a double mastectomy and radiation. Eventually, the cancer metastasized in her spine and hip, and she died in October of 2008. The dreadful waiting for my results ended when I got the phone call at work. I was taking my 2nd graders to the computer lab when my phone buzzed. It was my doctor telling me how sorry she was, but I had intraductal carcinoma in situ - DCIS. My life became a blur for several weeks. There were several tests, doctor’s appointments, lab work and research. Given my family history and the information that I gathered, my decision was to have a double mastectomy with reconstruction. My lab results post-surgery were good. NO FURTHER TREATMENT was needed! Recovery was not easy, but I knew that I while I was off of work, my salary and benefits would stay the same. That took a huge worry off of my mind. While recovering, I obviously was not able to run. Running was something that I had only started about three years prior to my diagnosis. Not being able to run made me realize how much running now meant to me. I set a goal for myself to not only get back to running as soon as I had clearance from my doctor, but to train for a marathon. My running friends signed up for the Detroit Free Press marathon with me. The training was challenging, inspirational and frustrating all at the same time. While signing up for that first Detroit Marathon, I came across several organizations that had multiple teams raising money for them. I immediately noticed The Pink Fund! I clicked on the area pledging that I would raise money to help other women with the financial burden they incurred while fighting breast cancer. This will be my 4th year that I have chosen to run to support The Pink Fund. I am honored that Molly MacDonald has asked me to be an ambassador for the 2018 race. I look forward to helping bring awareness to the mission that Molly has created with this important organization. 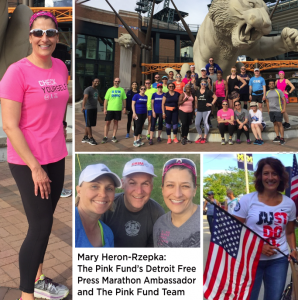 Runners interested in joining The Pink Fund Detroit Free Press Chemical Bank marathon team should contact maryheronrz@gmail.com or deborah@thepinkfund.org. all the goodies from above, plus a Pink Fund specially designed running singlet.